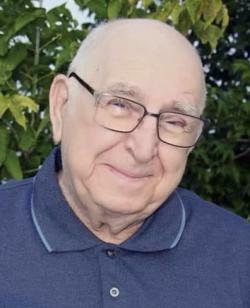 The death occurred at the Western Hospital, Alberton, on Friday, November 30, 2018, with his loving family by his side, of Roy Kennedy Fraser, beloved husband to Ruby Florence (nee Adams) Fraser, of Northport, age 85 years. Born on August 16, 1933, he was the son of the late Herbert and Olive (nee Currie) Fraser. Roy was a fisherman for most of his working life and was the manager of the Jacques Cartier Memorial Arena in Alberton for 25 years. He will be lovingly remembered by his children, Joanne (Alan) Hardy of Alberton, Gail (late Doug) Gallant of Alberton, Bev (Kenny) Ashley of Alberton and Kerry ( Kelly) Fraser of Northport. Cherished grandfather to Tyler, Mitchell, Kramer, Valene, Kendra, Karissa, Korbin and Karley. Caring great-grandfather to Dryden, Cameron, Taya, Grace, Madeline, Maddix, Gretta, Cody, Kate, Rhett, Zeke and Kinsley. Also remembered by Lorraine Kinch, a chosen family member for the past 50 years. Dear brother to Mildred MacKenzie of Rothsay, N.B. He is survived by brothers and sisters-in-law, Fred Hamill of Northport, Lily Riley of Alberton, Lillian Adams of Rosebank, Lorraine (Fraser) MacKinnon of Kensington, Eric (Sandra) Adams of Burlington, Ont., Freda Adams of Moncton, and Marge (Ted) Aukema of Ontario. He will be sadly missed by his many nieces, nephews, friends and acquaintances. He was predeceased by siblings, Franklyn, Ralph (late Ruth), Keir (late Vie), Hubert (late Greta), Reginald (late Venie), Charlie (late Elaine), Stewart (late Eleanor) and June Hamill. He was also predeceased by his father and mother-in-law, Jack and Naomi (nee Warren) Adams, brothers and sisters-in-law, Ivan Adams, Alvin Adams, Elmer Adams, Thelma (late Harry) Wells, Roberta (late Brendon) Wallace, Blanche (late Cleve) Hardy, Walter Adams and Gail MacDonald. Resting at the Rooney Funeral Home and Chapel, Alberton. Visiting hours Monday 2 to 4 and 7 to 9 p.m. Funeral Tuesday afternoon from the Elmsdale Church of the Nazarene for funeral service at 2:00 p.m. Interment in the Church of the Nazarene Cemetery. As an expression of sympathy memorials can be made and would be gratefully appreciated for furnishings to the new Palliative Care Unit of the Western Hospital, Alberton. 2:00 to 4:00 & 7:00 to 9:00 p.m.